Low-level laser therapy is a regulative medical treatment used in specialties such as Dermatology, Traumatology, Sports Medicine, Orthopedics, Dental Medicine, Urology, Gynecology, General Orthopedics, Dental Medical, Chiropractic, Veterinary Medicine, Physical Therapy, Natural Medicine, etc. Over 2000 studies have established that such laser therapy is both effective and safe. People only think of lasers as cutting lasers. In order to cut with lasers, it is necessary to increase the power density (PD) to between 300 and 10,000 Watts per sq cm. Lasers do not even begin to feel warm unless the PD is 5 Watts per sq cm. In low-level laser therapy, the so-called cold laser therapy, the PD can be as low as 1 to 3 Milliwatts per sq cm. Low level lasers are used widely nowadays, in applications such as bar code checkout, laser printers, compact disc players and medical therapy. Laser therapy devices (using about 500 mW power output) do not have a thermal effect. This means that they provoke no immediate visible skin reactions or sensations during therapy. Low-level laser therapy is a soft therapy, without side effects. As against this, the surgical applications of laser have a different purpose and they therefore use much higher levels of power. 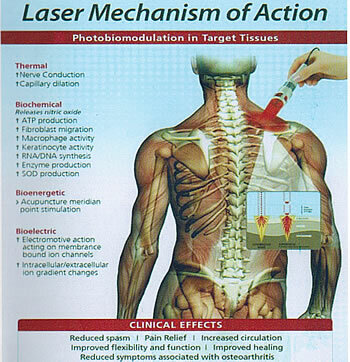 One of the most important functions of low level laser therapy is to re-polarize sick and injured cellular membranes. This allows essential nutrients to transfer from the blood into the cell. Research has shown that low level laser therapy can increase cellular ATP (fuel) by as much as 150 %. Photobioactivation is a tern applied to a light stimulus that initiates or accelerates a physiological response. Other stimuli used in medicine are, for example, temperature, ultrasound, electrical power, electromagnetic fields, etc. Laser therapy is being used as a successful treatment option for countless pain, inflammation, dental, burn and illness conditions all over the world. Lasers have been used as therapeutic energy to bring about favourable biological effects in people, plants and animals. Unlike many therapies and drugs that just treat symptoms, laser therapy actually promotes and enhances healing. Laser therapy is the future of medicine and it is a modality that is rapidly growing in popularity. In USA, the FDA cleared multiple laser and LED devices for the treatment of a variety of medical conditions including carpal tunnel syndrome, cervical neck pain, low back pain, generalized muscle pain and for the acceleration of wound healing. Technical light therapy is being used by governmental agencies such as NASA for treating medical conditions in space applications. The US Olympic training facilities have released statements of endorsement of laser therapy for athletes. The growing acceptance of laser therapy in mainstream medicine is an indication of the medical efficacy of this treatment modality. It is not only a viable option, but often a superior treatment option. Laser therapy in the correct frequency appears to be antiviral, anti-fungal, and anti-herpetic. Reduces inflammation by suppressing inflammatory enzymes that create swelling, redness, pain and heat. Enhances the release of anti-inflammatory enzymes. Laser therapy causes the release of healing enzymes and the production of endorphins, which are natural pain killers. 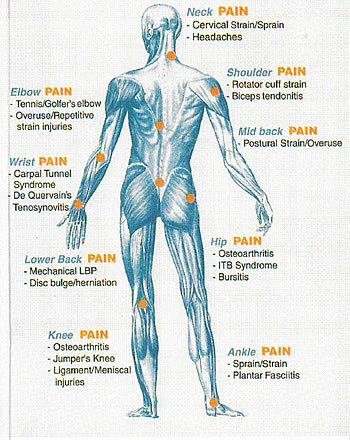 Releases tight muscles (both smooth and striated) that create chronic pain, join problems, and decreased mobility. Neovascularisation of lymphatic and blood vessels as well as vasodilatation, improved microcirculation and lymphatic drainage (resorption of oedema). Larger quantity of granulation tissue and accelerated epithelisation. Increased activity of osteoblasts promotes the formation of callus. Regulation of muscle tissue including myocardium. Enhancement of peripheral nerve re-growth. Prevention of central nerve degeneration and regeneration of peripheral axons after injury. Measurable changes in the potential of nerve cell membranes lead to its hyperpolarization as a good analgesic mechanism. Improved release reaction of S-endorphines. Changes in transmitter concentration at the synapsis. 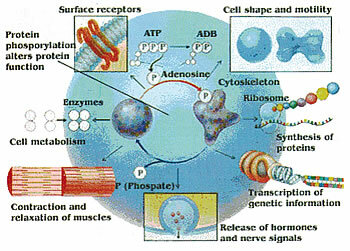 Relaxation of muscles induced by the neuromuscular unit (ATP increase). Activation of proliferation of immune cells including macrophages. Immune suppressive effect by reduced antigen perception of the T-lymphocytes (increased acceptance of a transplant). Yes, when low level lasers are used correctly, they are very safe. Low Level Laser Therapy has been proven completely safe in over 2000 worldwide studies. The most important safety regulation is to avoid pointing a laser at the eye. Protective goggles are worn by the patent and the doctor. Low level laser therapy is avoided in the following situations: cancer; pregnancy; long-term history of steroid usage; epilepsy; cardio-vascular compromised patients; patients with implanted pace-makers. There is no pain with laser treatment, and there are no known side effects. If pain increases marginally due to the treatment, it is an indication of tissue reactivity and this precedes the improvement. This is a sign that the laser therapy has increased the circulation and caused the release of toxins. Patients need 10 to 12 sittings spread over 2 to 3 months. Each sitting is usually for only 2 to 3 minutes. The beneficial effects can begin to get noticed within 3 months. Patients with acute conditions will frequently see beneficial effects almost immediately. Patients with chronic conditions may find that a slightly longer treatment regime is required before the effects begin to be obvious. According to studies, the success rate is almost 80%, and the chances of the problem recurring are remote. Extracorporeal Shock Wave Therapy (ESWT) is a new technology using shockwaves to treat chronic, painful conditions of the musculoskeletal system. A shockwave is an intense, but very short energy wave traveling faster than the speed of sound. The word "Extra-corporeal" means "outside the body" and refers to the fact that the shockwaves are generated outside the body. Extracorporeal Shock Wave Therapy can be used to treat a wide variety of musculoskeletal conditions, particularly those involving where major connective tissues attach to bone. When simpler and less expensive treatment alternatives have failed or aren't appropriate for some reason. Cavitation bubbles are simply small empty cavities created behind an energy front. They tend to expand to a maximum size, then collapse, much like a bubble popping. While ESWT is used on a wide variety of body tissues and medical conditions (see "What conditions can you treat with ESWT?" section above), the effects of shockwaves are best documented in areas of changes in tissue density, such as where tendon attaches to bone (enthesiopathies) and where bone attaches to ligaments (desmopathies). For this reason, it is very effective for painful connective tissue pain in such locations as the foot, knee, hip, elbow, and shoulder. Dr. Sandeep Saluja is Gujarat's first trained and Certified Laser Therapist, certified by Dr. Hans Jorg GroBer, the renowned German laser therapist.